Rats are of the scientific order Rodentia, a group whose identity includes having teeth that are made for gnawing. Rats have a total of 16 teeth, only four of them are used for gnawing. Two of these teeth are located in the top front of the mouth, and two are located in the bottom front of the mouth. 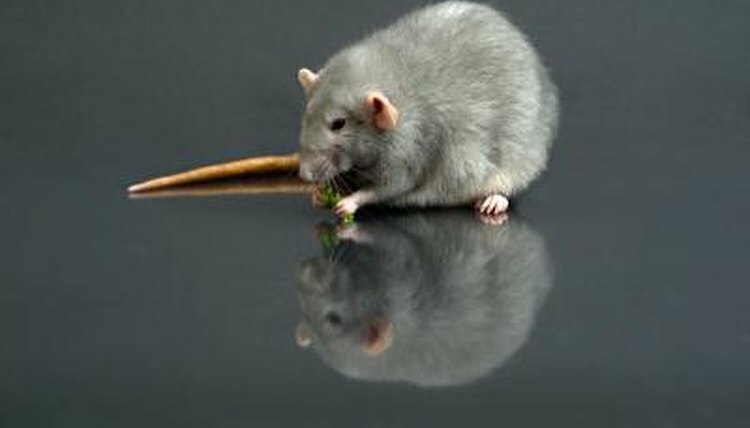 The teeth that rats use for gnawing are called incisors. They're not like the incisors humans have; they do not have roots. It is the lack of roots that cause rats' incisors to grow constantly. The incisors' curved shape is a result of gnawing in combination with the makeup of the tooth. Only the outsides of the incisors are coated with enamel; when a rat gnaws, the insides of the incisors wear away more quickly than the outsides, causing the teeth not to curve but to have a curved shape. The musculature of a rat's jaw goes hand-in-hand with a rat’s gnawing. The jaw not only moves up and down, it also shifts forward and backward during gnawing. This is because muscles are attached to the lower jaw more forward toward the nose than in other mammals. Additionally, muscles attached to the upper jaw go through the eye sockets and behind the eyeballs. These muscles cause a rat’s eyes to pulsate while it is gnawing. The frequency of a rat’s gnawing contributes to the well-developed nature of all of the jaw muscles. Constant growth of the incisors causes rats gnaw to gnaw for life, literally. They could die if their teeth get too long they can't get their mouths around something to gnaw on. Meanwhile, the rat instinctively knows to slow the routine when the teeth are wearing too low. Gnawing also keeps the incisors sharp. The top two stabilize items as the bottom two do the mashing. During gnawing, only the four incisors touch each other -- the jaw pulls forward to prevent the other teeth from wearing away. The 12 teeth in a rat’s mouth that aren't incisors are molars, six on the top and six on the bottom. The job of the molars is to pulverize food prior to swallowing. Unlike humans, rats do not have canines and premolars. A space known as the diastema exists between their incisors and molars. This space does serve a purpose; rats fill the space with the insides of their cheeks while they are gnawing so nonedible items fall out of their mouths before reaching the molars. Why Do Cows & Horses Have a Lot of Molars?